I've probably ranted about this before but I feel like I need to address it yet again. Please, for the love of all things holy, do not refer to the UK (United Kingdom of Great Britain) as "England"; do not interchange England with the UK. England is not a country; I do not live in "England"! However, please feel free to continue referring to the Queen as the "Queen of England" - that error, I do not mind. So, please study the map above. 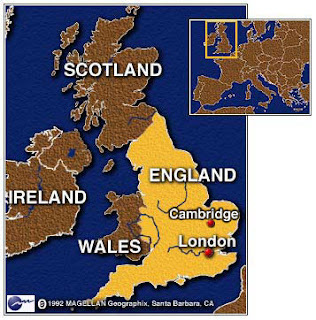 The yellow part is England. England, Scotland, and Wales are known as “Great Britain". Great Britain plus Northern Ireland equals "The United Kingdom". For further information, check out this handy breakdown of the terminology. Also, you can call my husband British or Scottish (preferably the latter), but DO NOT ever call him English. I once heard Scotland described as "the town in England where they make whisky". Melaina - I think most Scottish people would bristle at being called, "English" although it is a fun wind up! Loth - I think that description is - hands down - the best ever. Please reassure me it wasn't a Canadian who said that though! Most people really don't understand ... and I can understand why they don't. Really - to the American mind, at least, if you're the same country, you're the same people. True, a Californian wouldn't want to be confused with an Oregonian, but they wouldn't really care all that much. Also? California itself is larger than all of the UK. The idea of a place smaller than that thinking they were their own country? That's hard to fathom. Thank you for trying to put the world to right on this subject. Scots are terribly patriotic (most folk are, but Scots and Irish in particular) As a Scot living in the yellow bit you've shown on your map there is constant badgering from the 'locals in the yellow zone' about why I left my homeland - the phrase "I'm a technical missionary' usually keeps them quiet as they try and work out exactly what I'm doing here. Love your blogs, good mixture of sense and humour - Sláinte. Thanks, Lochinvar! It does my head in when people refer to the UK as "England"! :), it is so funny.